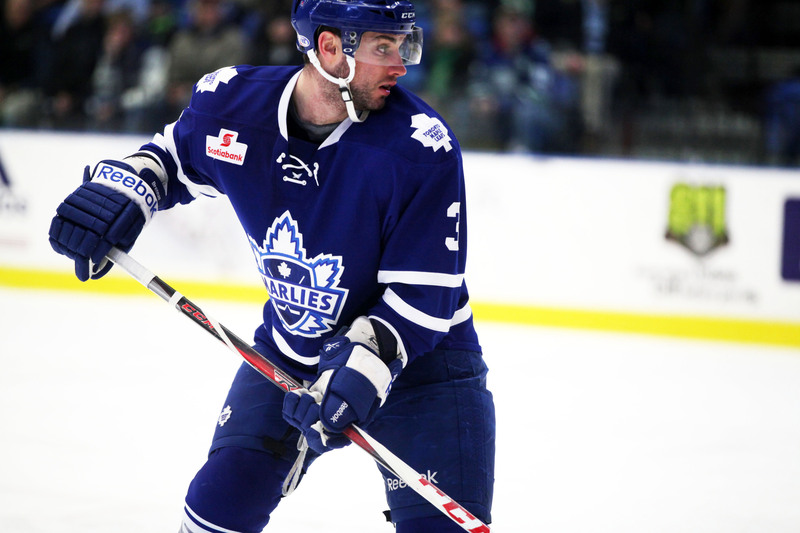 Toronto Maple Leafs‘ 5th year defenseman T.J. Brennan(3) is continuing his career year in the minors with affiliate Toronto Marlies. He played in a season high 75 AHL regular season games scoring a new best 25 goals and 47 assists for 72 points, which basically doubled his previous yearly totals in the three scoring categories. His 2013/2014 totals were also good enough for lead on the team in tallies and overall. He was also 3rd in the league for points. The 6’1″ 213 lbs. blue liner recently won the Eddie Shore Award for best d-man this year. He only has 40 NHL games to his credit, despite being a Buffalo Sabres‘ 2nd round high selection pick. The irony to those numbers is his best numbers with on a short, freshly traded 19-game stint with Florida Panthers, where he put up a pair of goals and 7 assists in 19 games. He was picked up for a draft pick and then sent in an off-season trade to Nashville Predators, who decided not to qualify the pending restricted free agent. Picked up by the Leafs, they, as the story goes never recalled him because they didn’t need him long-term and feared potentially losing him on waivers. It is so much easier to just call up an entry level player. Now marching the Marlies through the Calder Cup Playoffs he has 4 goals and 4 assists in 9 games without a loss going into the Western Conference Finals. The 25-year old is set to become a free and in the clear unrestricted free agent this summer. He received one-way contract money but will someone step up for 2014/2015 to try his experience for a full campaign? We’d sign him. 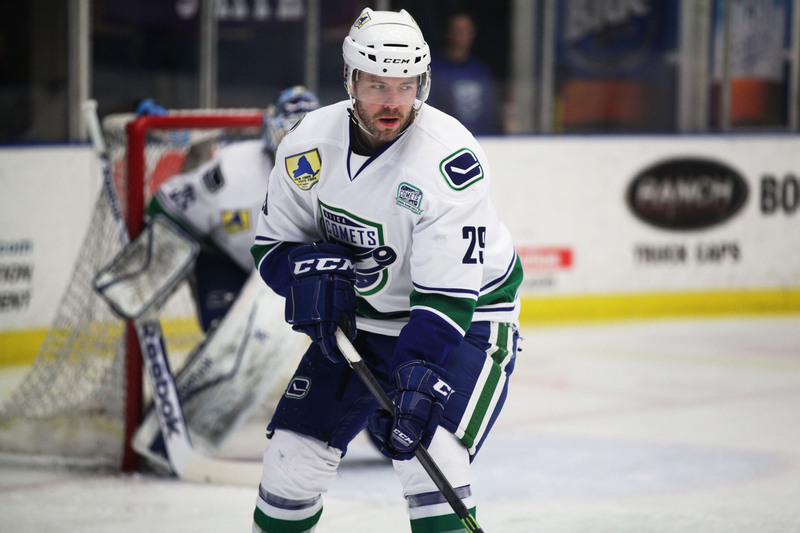 13-year veteran defenseman Kent Huskins(29) signed an AHL contract to join Utica Comets a month into the 2013/2014 season. Possibly looking for a new NHL suitor after splitting less than 20 games the previous year with Detroit Red Wings then Philadelphia Flyers, it’s possible he saw a possible opening in the parent club to influence his decision to sign a minor league deal. He appeared in 65 games with the expansion central New York club adding another 10 points to his league totals (473-33-101-134). He also owns a +33 rating. The big 6’4″ 205 lbs. blue liner has also skated in 318 contests in the show putting up just 13 goals and 55 assists, but his stay-at-home style and strong defense of his own zone gives him a highly accountable +46 plus/minus. It took him 5 years of trolling with farm teams before he received his first opportunity to play at the highest level but from there he spent six straight seasons on top. Not bad for a player that was originally a Chicago Blackhawks‘ 6th round pick in the 1998 draft (#156 overall). The almost 35-year old could either stay put or try his hand elsewhere but is probably happy earning a decent payday playing pro hockey. He won a Stanley Cup Championship in 2007 as a member of Anaheim Ducks. Undrafted 6th year left wing Derek Whitmore(11) was having problems fitting in to a veteran laden Hershey Bears‘ lineup after signing a one-year minor league contract with the team upon his return from a short, half season stint in Germany’s DEL skating for Augsburger Panther. He did reasonably well overseas connecting for 9 goals and 14 assists in 26 games. Loaned in a player swap at the trade deadline to Adirondack Phantoms, the 5’11” 185 lbs. forward has benefited, scoring almost as many points with his new squad in half the amount of contests. He’s well off his 40+ point pace from 2010-2012 in Buffalo Sabres‘ affiliate system but given another full season workload could find the mark again. 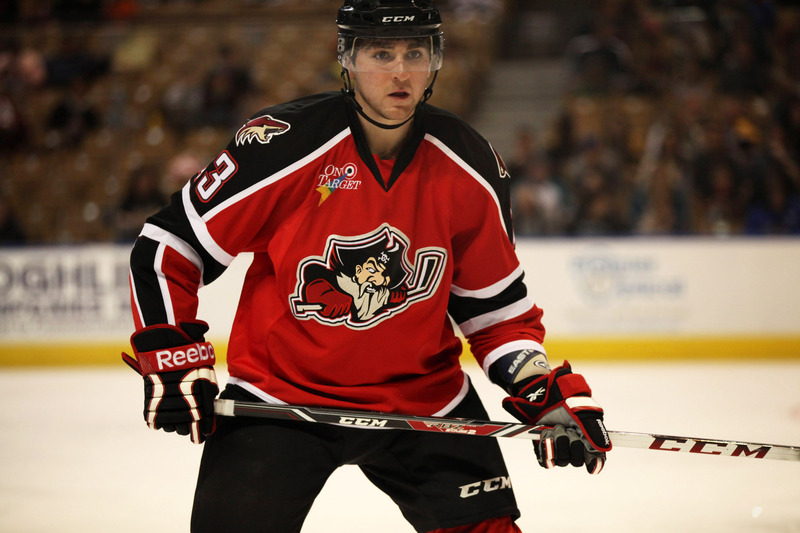 3rd year defenseman Cade Fairchild(2) was picked up in an AHL trade deadline deal by Phoenix Coyotes for future considerations and reassigned to their farm club, Portland Pirates. Originally a St. Louis Blues‘ 4th round pick in the 2007 draft, he skated mostly with their minor league affiliates apart from 5 NHL games in his rookie season (one assist). In a somewhat surprisingly move he was also sent down to the ECHL for a pair of contests for Kalamazoo Wings near the beginning of the current season. The slightly small-ish looking 5’11” 178 lbs. 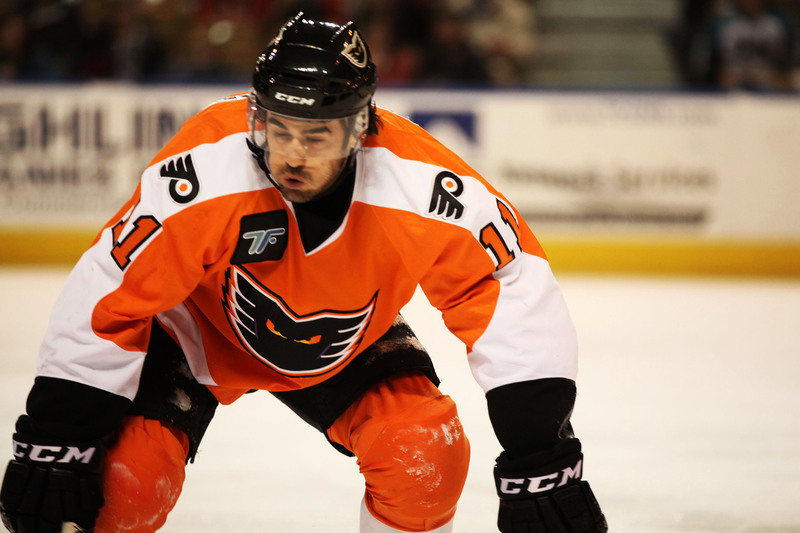 blue liner has appeared in 150 AHL contests scoring 10 goals and 55 assists with a massive +30 rating. He dished out his fair share of helpers in four years at University Of Minnesota. Tbe 25-year old is set to become an unrestricted free agent at the end of the current campaign after signing a one-year extension. It will be interesting to see where he ends up playing in 2014/2015, but I doubt anyone will be surprised if he decides to take his talents overseas. 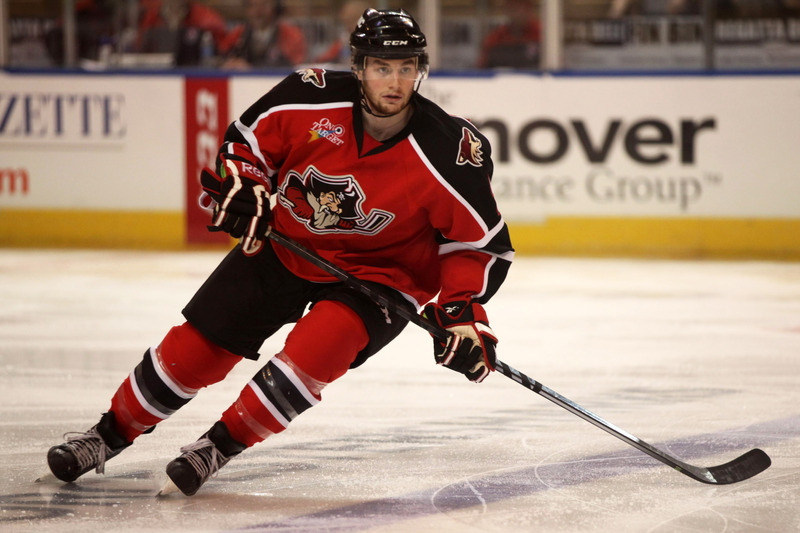 Phoenix Coyotes‘ 2nd round pick in the 2012 draft (#58 overall) left wing Jordan Martinook(18) surpassed his rookie year high marks with minor league affiliate Portland Pirates for goals, assists and points in one less AHL game than he played in all of his first season. He reached the new mark in 52 contests and skated in 53 during his first campaign. He currently sits at 11 goals, 12 assists for 23 points, which eclipsed last year totals (9-10-19). Almost ironically he set the new totals in that 52nd game, where he notched a tally and a pair of helpers. The 6′ 202 lbs. forward wasted little time turning pro after being selected as a 20-year old (currently 22), skating in his second season with Vancouver Giants of the WHL. He managed to put a nifty 40 goals in 2011/2012. His entry level deal runs through 2014/2015 and his play definitely looks to be reaching that next level, which could score him an NHL recall before the end of this season depending where the parent club’s playoff push is at in the next couple of weeks. Undrafted rookie defenseman Mathieu Brisebois(25) undergoes an address change in his first pro season. He was traded from Phoenix Coyotes‘ prospect system on reassignment to affiliate Portland Pirates to Chicago Blackhawks‘ farm club Rockford IceHogs. The somewhat undersized 5’11” 190 lbs. blue liner played in 28 AHL games picking up a goal and three assists with a -5 on a cellar dwelling team but was also a healthy scratch on more than a few occasions. In his fourth year of QMJHL with Rouyn-Noranda Huskies he led the league in goals, assists and points by a d-man and continued on a similar tear in the playoffs. The 21-year old signed a three-year entry level deal that keeps him under contract through 2015/2016. It will be interesting to see if he can parlay his junior hockey finish into producing on the score sheet at the next level. 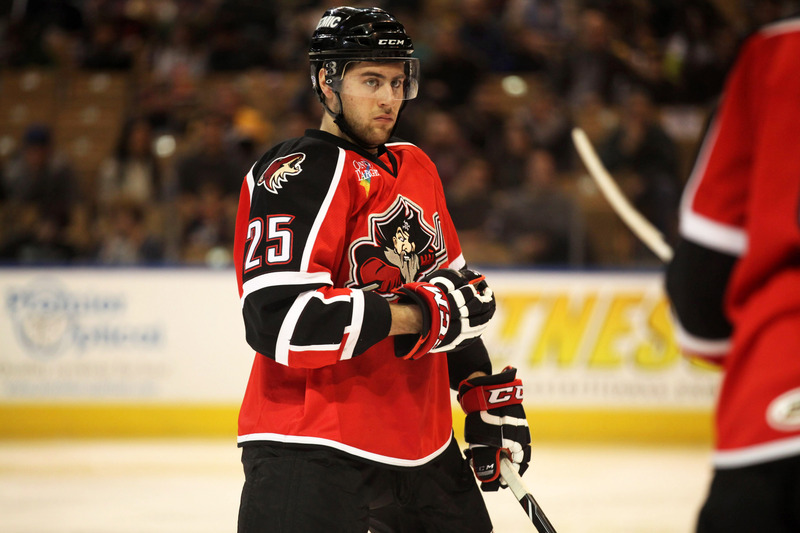 2nd year center Corey Trivino(23) received his first AHL recall playing 11 games with Portland Pirates on loan from Stockton Thunder. He wound up with four assists and managed a +3 rating before being returned on a team that is mostly slipping in the standings. Originally a New York Islanders‘ 2nd round pick in the 2008 draft (#36 overall) he was never signed, although attended many team training camps and eventually inked his first deal to join Florida Everblades of the ECHL. The 6’1″ 190 lbs. forward put up stellar numbers in his rookie season with 18 goals, 33 assists and a +17 plus/minus in 63 games and added another 3 goals and 8 assists in 13 Kelly Cup Playoff contests. He was also outstanding through a pair of OPJHL seasons at age 16 and 17, where he amassed 127 points (43-84) in 88 games. Next up, he chose to attend Boston University and won an NCAA National Title in his first campaign at the school. Personal problems would arise from there and he was eventually expelled in his fourth year of college despite having his most productive goal scoring start with 13 strikes in 15 games. At this point the 24-year old is looking to only put any past crossroads behind him and continue what he does best: putting points up on the score sheet. At 26-years old Fort Wayne Komets‘ center Scott Fleming(24) has to be enjoying his “rookie” season. He first signed an agreement to join the team’s preseason roster but once they saw him play he was a part of the team. He last played on ultimate reassignment to Gwinnett Gladiators in 2011/2012 after invites to affiliates Phoenix Coyotes and Portland Pirates‘ training camps. His first year pro was cut short after only 6 games with 3 goals and 1 assists after suffering a season-ending concussion. The 5’11” 180 lbs. undrafted forward is another player that took a somewhat longer route before ever signing a contract. He started at 16 with three years marking up the score sheet in the OPJHL before moving on to 4 seasons of hockey at Dartmouth College, where he served as team captain in 2010-2011. After almost two full campaigns of sitting on the sidelines, his return picks up where he left off. In 40 ECHL games he has 11 goals and 23 assists with a +13 rating. 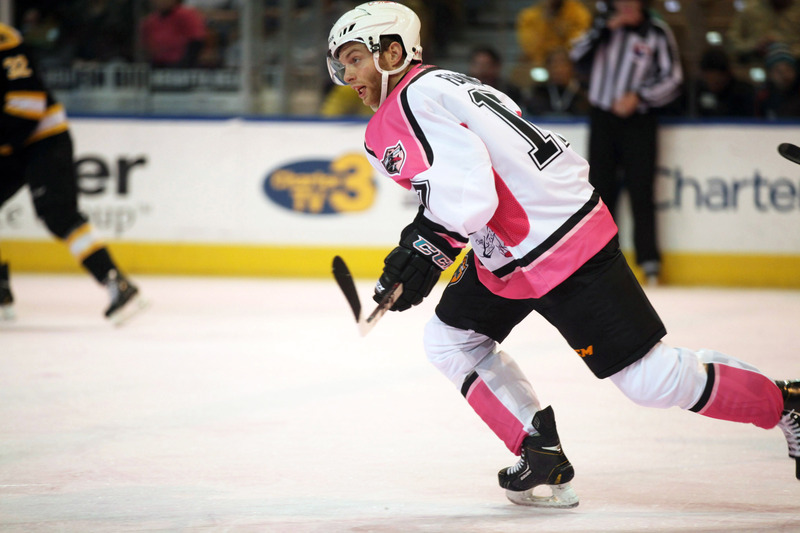 His point production got him noticed as Worcester Sharks signed him to a pto to fill some injured holes in the lineup. He skated in 4 AHL games and dished a pair of helpers with a +1 plus/minus, which could easily grab the attention on another higher league club. For now though, he’ll go back to double A hockey, continue to work on his game and help his team win. Phoenix Coyotes‘ undrafted rookie defenseman Daine Todd(3) is another recent player to take a somewhat Jeffy, Family Circus route to turning pro. He even sat out the entire 2008-2009 campaign and lost another pair of seasons to injuries before he ever signing a contract. To make matters stranger he played an over-age year with Medicine Hat Tigers and won two WHL Championships before being sidelined and returned for four campaigns with University Of New Brunswick. He also won a college title with them. The small-ish looking 5’10” 185 lbs. former forward turned blue liner battles pretty hard but is a -14 plus/minus so far in his first season but is also on the ice for many different kinds of game situations because of his versatile play. 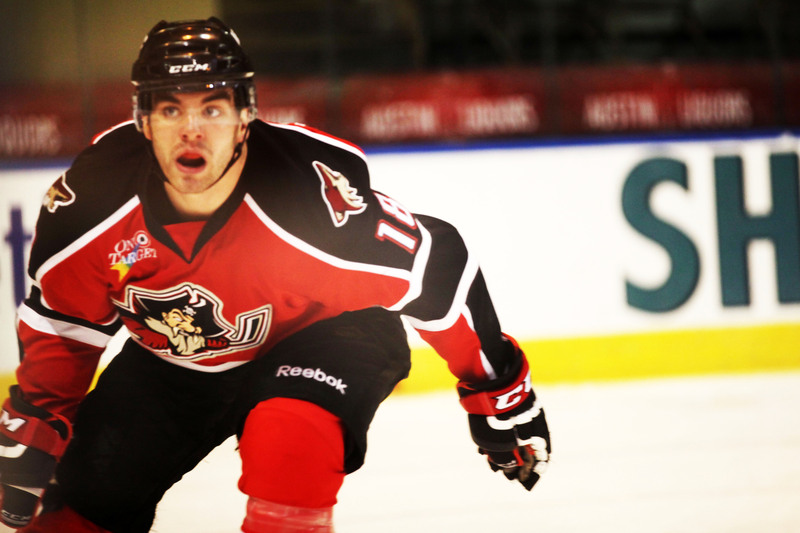 On the upside he has 2 goals and 21 assists in 44 games with Portland Pirates. His helper total is first among rookies and third overall on the team. He’s signed to an AHL contract under the watchful eye of the parent club . At 27-years old he might become one of the oldest players to sign a one-year entry level deal. Phoenix Coyotes‘ 3rd round pick in the 2012 draft (#88 overall) defenseman James Melindy(4) spent the start of his rookie season on the injured reserve list with minor league affiliate Portland Pirates. Finally healthy enough at the turn of the new year he made it back into the lineup and through 14 AHL games he has his first pro marker but a -8 rating on a team that struggles at times. At 6’3″ 187 lbs. he’s a pretty big, mostly stay-at-home style blue liner but he did show some offensive upside in his last couple campaigns of junior hockey with Moncton Wildcats before deciding to turn pro after his third year. Signed to a three-year entry level deal through 2016, the recently just turned 20-year old is probably viewed by the parent club as a work in progress despite his pretty high selection but looks to have the ability to break out sooner than later and could get an NHL look as soon as next season.